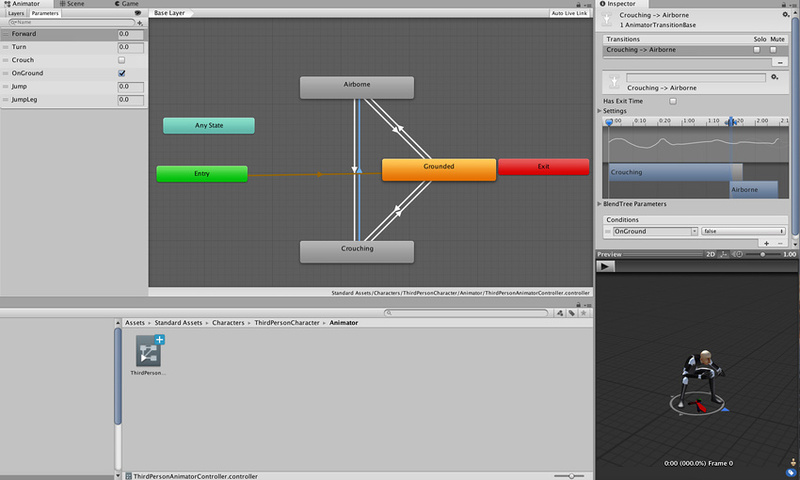 Easy workflow and setup of animations for all elements of Unity including objects, characters, and properties. See in Glossary - the ability to apply animations from one character model onto another. Simplified workflow for aligning animation clips. Convenient preview of animation clips, transitions and interactions between them. This allows animators to work more independently of programmers, prototype and preview their animations before gameplay code is hooked in. Management of complex interactions between animations with a visual programming tool. Animating different body parts with different logic. See in Glossary, which contain information about how certain objects should change their position, rotation, or other properties over time. Each clip can be thought of as a single linear recording. Animation clips from external sources are created by artists or animators with 3rd party tools such as Autodesk® 3ds Max® or Autodesk® Maya®, or come from motion capture studios or other sources. See in Glossary” which keeps track of which clip should currently be playing, and when the animations should change or blend together. See in Glossary system, where humanoid characters are mapped to a common internal format. See in Glossary. This component has a reference to an Animator Controller, and (if required) the Avatar for this model. The Animator Controller, in turn, contains the references to the Animation Clips it uses. See in Glossary in the Project window. 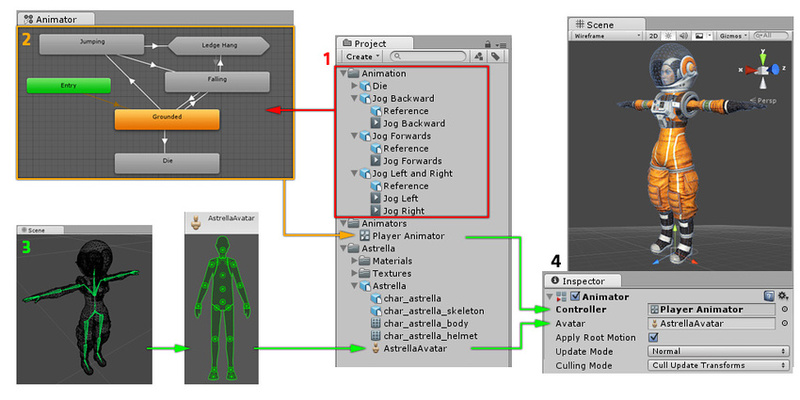 The rigged character model (in this case, the astronaut “Astrella”) has a specific configuration of bones which are mapped to Unity’s common Avatar format. This mapping is stored as an Avatar asset as part of the imported character model, and also appears in the Project window as shown. See in Glossary view shown above, you can see the Animator Component which has both the Animator Controller and the Avatar assigned. The animator uses these together to animate the model. The Avatar reference is only necessary when animating a humanoid character. For other types of animation, only an Animator Controller is required.